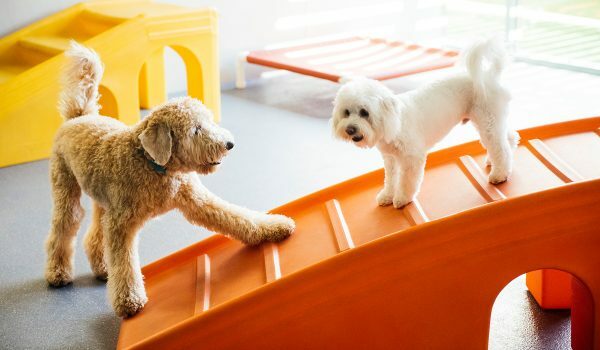 The ultimate dog daycare and boarding in North Dallas has arrived! Owners John and Kris Dyer are happy to welcome you and your pup to our brand-new, open-play facility. We offer dog daycare, boarding and spa services for your furry family member. We are proud to serve pet parents in North Dallas, Addison, Farmers Branch, and the surrounding Galleria area of Texas. 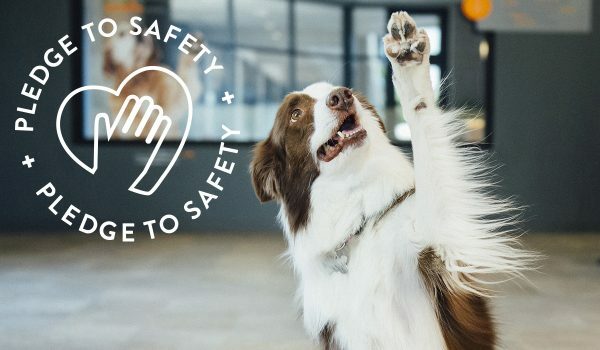 At our clean and modern facility, we make it our mission to keep your dogs safe and happy during their time with us. They will be treated the same way you would treat them at home – as an important member of the family. 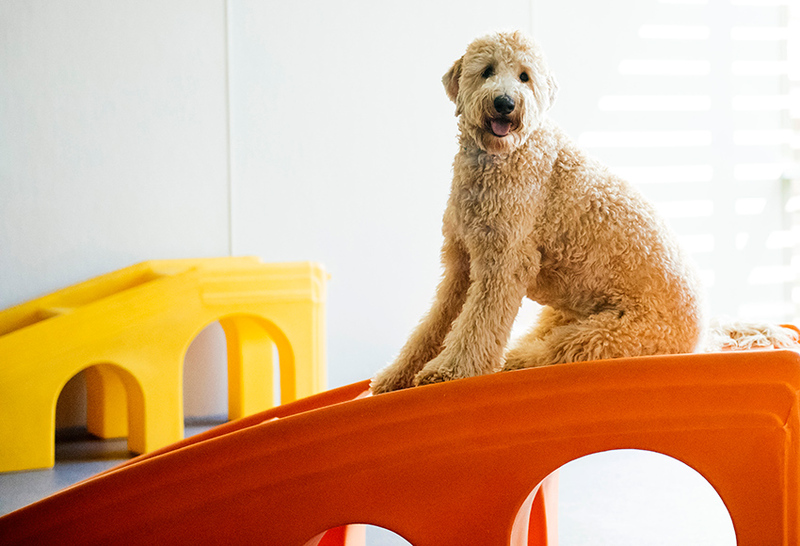 Our spacious playrooms are designed with your pup in mind. Your dog will enjoy hours of fun and socialization in a playroom with other dogs of similar temperament, play style, and size, all of whom are up-to-date with their vaccinations and have passed our Dogtopia evaluation. Our certified Canine Coaches will constantly supervise the playroom during playtime, keeping your dog’s safety as their top priority. Your dog will be in very capable and experienced hands during their time with us! Being home alone while you’re at work can leave your dog lonely and stressed. Dogs are social beings and interaction with other dogs and humans gives them the stimulation they crave. 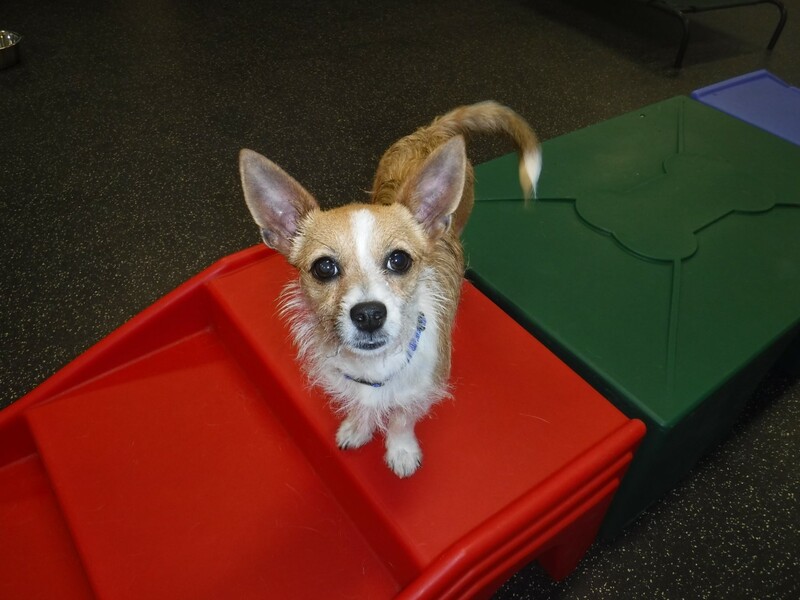 At Dogtopia of Dallas-Inwood, they will enjoy hours of exercise and activity in our open-play, off-leash play setting and learn new things while having fun. 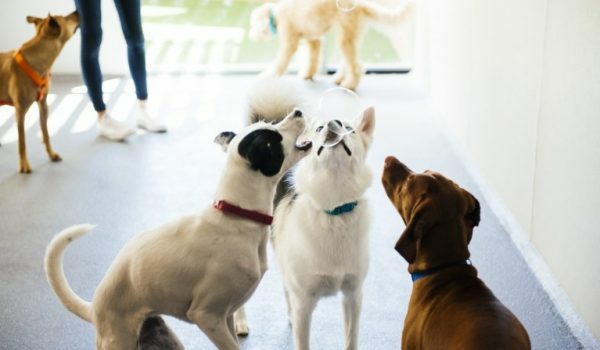 Our facility features a variety of spacious, supervised playrooms in which dogs are separated according to their size and temperament to ensure a safe and comfortable environment for all. Both half-day and full-day daycare options are available, with convenient pick-up and drop-off times designed to work around your schedule. If you need to leave your dog overnight or for a longer period, try our safe and convenient boarding services. It’ll be a fun vacation for your dog while you are away, as they will spend their days playing with our other dogs and our wonderful team. We also offer spa services for your pup, to keep them clean and looking sharp. Our professional team can take care of the bathing and cleaning, or you can do it yourself at our fully equipped spa. Please contact us for a detailed tour of our facilities. We would love to meet you and your dog and show you everything we have to offer! 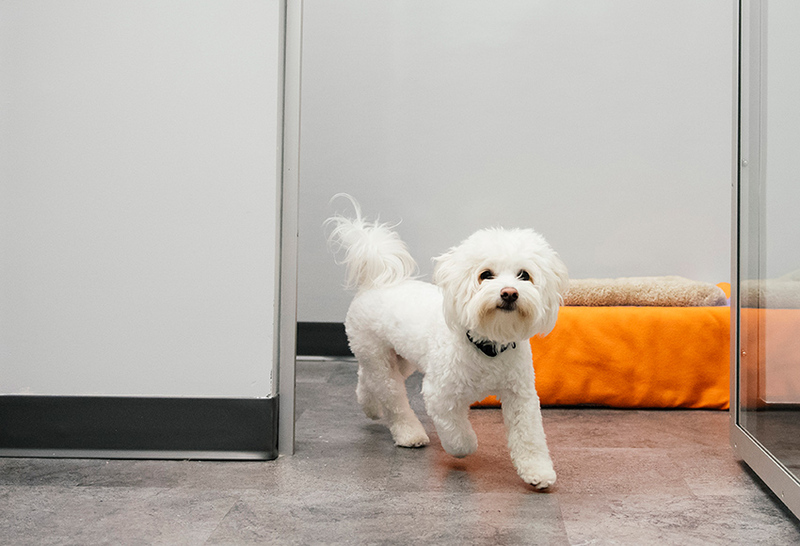 Our brand-new facility spans 7,200 square feet and has three spacious playrooms for your pup to enjoy. The entire space has been designed with your dog’s safety and comfort in mind. 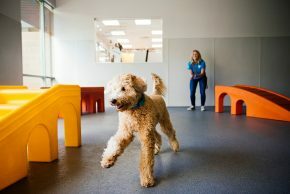 Rubberized flooring in the playrooms keeps their joints and paws in good health, while the temperature and air quality is maintained using HVAC systems. The playrooms will remain the comfortable temperature of 65-70 degrees Fahrenheit, no matter what the weather outside is. Sanitization is taken seriously by us and we ensure the highest levels of cleanliness by deep-cleaning our playrooms and other areas of the facility multiple times a day. 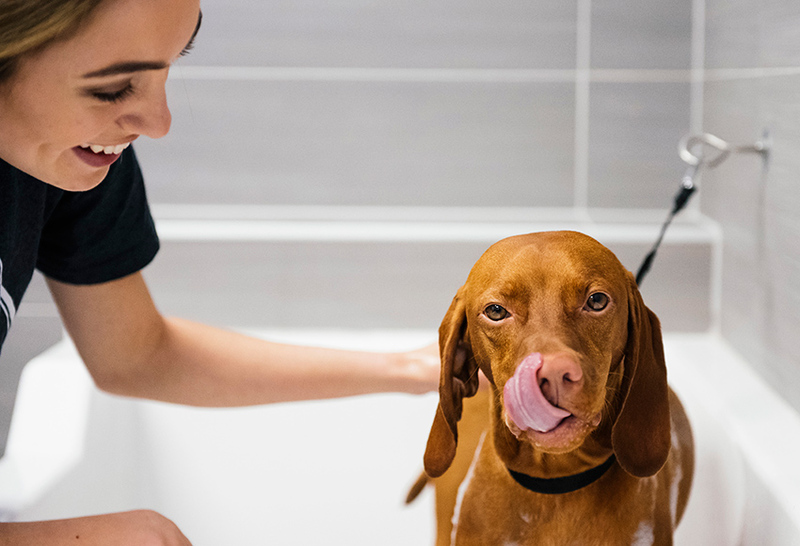 We only use pet-friendly cleaners that are proven to be biologically safe for your dog. You can keep an eye on your dog by accessing Dogtopia of Dallas-Inwood’s live webcams, which are installed in all playrooms. See them having fun with their furry friends or simply relaxing in the pleasant sunbeams coming in through the windows! Our state-of-the-art facility is centrally located in North Dallas, off the Dallas North Tollway on Inwood Road (between Alpha Road and Galleria Drive). We are just a block north from the LBJ/635 interchange and are located right across the tollway from the Galleria Mall. We offer plenty of parking for our customers, with more than 25 dedicated spots right in front of our building. Book an appointment for daycare, boarding or spa services by contacting us today. We can’t wait to meet you and your dog! We’ll schedule a Meet & Greet, during which our staff will evaluate your dog to determine if they are a good fit for our open-play setting and also review their history and health. We require all dogs using our daycare and boarding services have current vaccinations and be free of fleas and ticks. The Meet & Greet also helps your dog get familiar with our facility and team. A tour of our daycare center is provided without any obligations. If you plan to book our dog boarding services, we suggest you bring your pup in for at least three days of doggie daycare before leaving them overnight so they can become comfortable with the space and our staff. At Dogtopia of Dallas-Inwood, our friendly and experienced team will treat your dog like their own. We can help you choose the daycare, boarding or spa package that suits your schedule and your dog’s needs. Call us at 214-328-3206 to speak to one of our knowledgeable team members or use our contact form to reach out to us with any questions. We accept American Express, Visa, MasterCard, Discover, all major debit cards and cash. You can also schedule your dog’s Meet & Greet today or download and fill out our enrollment form before your first visit.